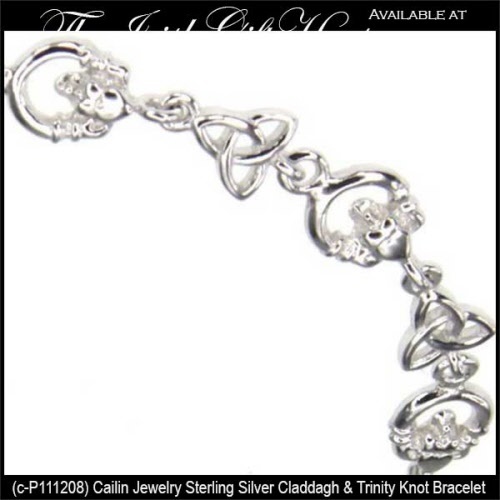 Sterling silver Celtic bracelet features both Claddagh and Trinity knot links. Sorry, this bracelet is sold out and we do not know if or when it may return. This Celtic Claddagh bracelet has been hallmarked sterling silver by the Irish Assay Office at Dublin Castle in Ireland. This sterling silver Celtic bracelet features sixteen Claddagh and Trinity knot links. The alternating links are 1/4” tall and the bracelet is 7 1/2” long. The petite Claddagh bracelet is crafted by Cailin Jewelry in County Kildare, Ireland and it is gift boxed with the Galway Folklore along with Celtic knot and Claddagh history cards, complements of The Irish Gift House. Sterling silver Celtic bracelet features two differently sized knot-work links.